On June 28th we went down to Rainer, Oregon to my brother Mike's house for a graduation party in honor of the recent high school graduates. It was great to be together as a family again. 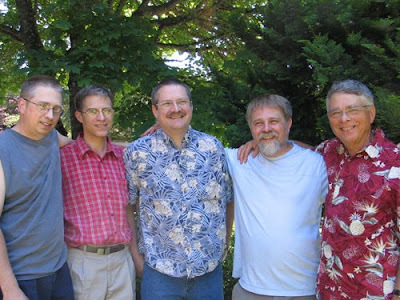 Starting on the left, my brother Tom, Myself, brothers David and Mike, and my dad, John. 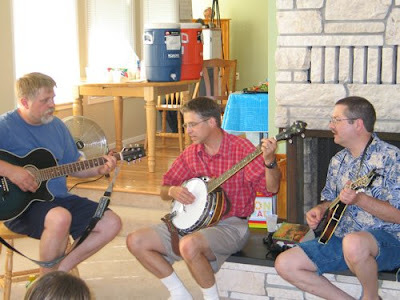 My banjo has been in storage for four years, but we dusted it off and enjoyed remembering some of the songs we used to play. I just put this picture in to make Chuck Talbot jealous. Chuck is a co-worker in the Philippines who plays banjo and goes on survey trips with me. 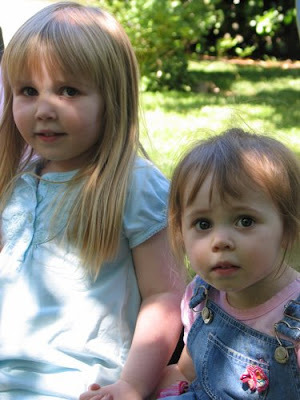 Below is a picture of my nieces, Emma and Hannah. They don't know us yet, but we hope to be good friends soon.